Over December and January I decided to discover the unknown. 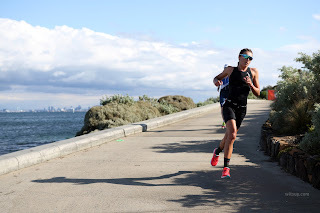 I have never done a half ironman before but I was excited to give the challenge a go. With the decision to stay home and not go to Falls Creek this year, it gave me something to train for whilst being at home. I gradually started to build up the km’s on the bike to more specific TT efforts and longer tempo runs. Every week was a similar session so I got plenty of consistency to see how I was improving. I also added 3 days a week of gym at NSWIS into my program which has helped me build a lot of strength.